Ever tried creating a triptych? Have no idea what to do and what things to look for when you’re putting it all together? This article will explore how to make a triptych and set you up on the right track with some useful tips and advice on composition, structure and design. You’ve probably heard this phrase when it comes to talking about triptychs, or indeed, any multi-panel work. But what does it actually mean and what do you need to do? Your goal is to create three individual panels which work well together and visually complement each other. Most importantly, the overall impression and impact on the viewer is greater when the three pieces are viewed together in their entirety, and visually processed as a single entity. Essentially, the three images will have more meaning and context when seen together, rather than apart. As with any single photograph, a triptych must still communicate something to the viewer and the way in which the three images relate to each other is extremely important. Panels which work in harmony, reinforce and expand upon shapes and patterns or thematic ideas, and which serve to unify an overall concept or vision provide compositional strength and coherence. Establishing a strong sense of unity and synchronicity across your three images is the most important element in how to make a triptych. So, let’s look at the different techniques you can employ to achieve this. Consider your angle of view. Do you want this to be similar throughout or deliberately varied for each panel for a specific effect? How close or far away are you from your subject matter? Ill-considered and inconsistently sized subjects across your panels may result in a disjointed look. What depth of field are you using and will it be the same across all the panels? If you have a narrow depth of field in one panel and then markedly change it in another for no apparent reason, there will inevitably be a loss of cohesion. Keep your colour palette consistent and unified. Avoid strong, distracting colours where you don’t want them. Be aware of where the lighter areas of the image are and avoid having bright sections on the extreme edges of your outer panels. 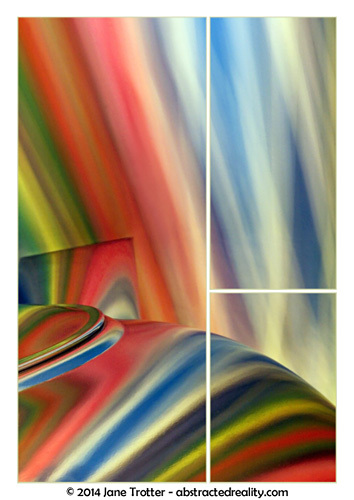 The colours in ‘Astral Plane’ morph and merge into each other, giving depth and an ephemeral quality to the image. Use the shapes and patterns inherent in your subject to establish and form visual connections across the three panels. Elements may be echoed in each individual panel or you may choose to work on a larger scale where the overarching ‘shape’ only becomes apparent when the three panels are viewed together. Consider mirroring effects to provide a sense of symmetry and balance. Keep the elements in each panel roughly the same size. In ‘Over the Shoulder’, the figure in the image is only revealed when the left and middle panels are viewed together. A second person is hinted at in the panel on the right. 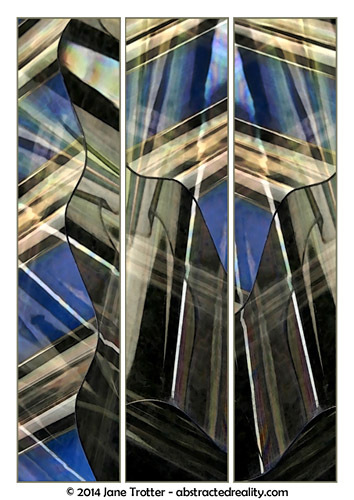 The overall design of this triptych is reliant upon an expansive view and interpretation of the individual components. If you are using a single image for your triptych and positioning your panels in the order in which they appeared in the original image, these natural ‘cut points’ will provide a strong, visual connecting link. Imagine a shot of a wave breaking on the beach. There’ll be a natural connecting line inherent in the wave formations which will then translate across into the triptych. ‘Splay of Colour’ uses a ‘T Cut’ to divide the image and the colourful, sweeping shapes and gestures connect naturally across all three panels. If you are telling a story in your triptych, try to maintain a consistent tone or ‘feel’ in your images. You want your narrative to unfold effortlessly, without confusing the viewer or leaving them with the overall impression that something didn’t quite jell. For example, you have created a study of a flower. Each panel represents a stage in its growth and ultimate decay. If you have used a gentle, soft focus approach for the first two images of bud and bloom and then adopt a very stark and sharply focused portrayal of the bloom in decay for the final image, this inconsistency in presentation will tend to mar the overall effect. I believe you should be drawn into a triptych so much that your mind begins to process it as if it were a single image or one visual experience, and not three distinct components. Perhaps a good question to ask yourself is – can the triptych withstand having a panel removed? Will it still possess the same, meaningful visual impact? Will it still be able to convey the same narrative? If the answer is no, chances are you’re on the right track. If it’s yes, then maybe you need to rethink your composition. 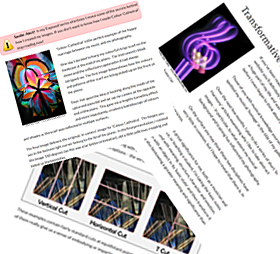 I thought I’d use my triptych ‘Interlaced’ (the image on the left below) to illustrate what I mean. You can see the example in the middle just doesn’t have the same dynamic energy without the top panel. Those red diagonals are needed to help push you back into the composition. Without them, your eye tends to move right out of the middle panel and there’s no counterbalance. The example on the right doesn’t have enough weight at the bottom to withstand the dominance of red in the top panel – the composition feels top heavy. It really needs the bottom panel to help redistribute the colours and establish a better equilibrium of line and colour. 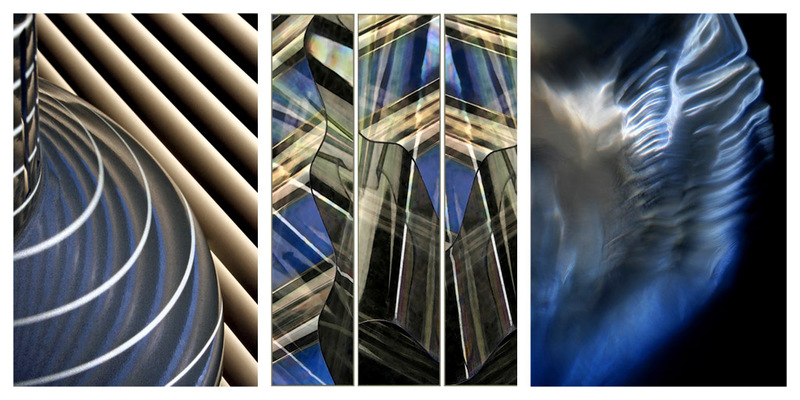 I’m an abstract photographer (as you’ll probably have guessed by now judging from the triptychs I’ve used as examples in this article!) 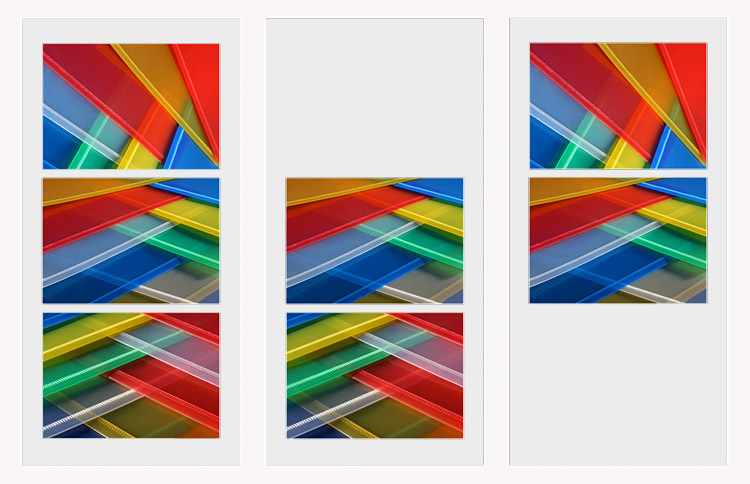 I’ve found abstracts lend themselves very well to the triptych format and would encourage you to try creating your own abstract triptychs. 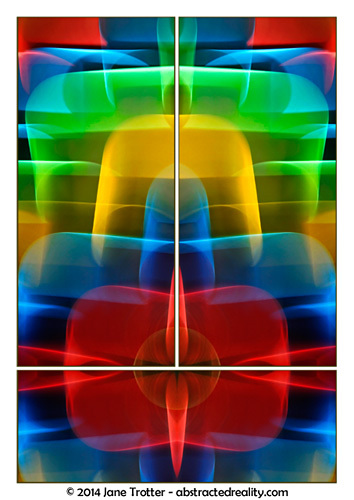 If you’d like a little extra guidance on how to make a triptych, you can read my other articles on The Art of Creating a Triptych, The Triptych Cut – 7 options for arranging your panels and The different types of Triptychs. If the whole concept of abstract photography is – well – just too abstract, then check out my article on the Definition of Abstract Photography for some extra clarification.